Melbourne Institute education team awarded the Trevor Swan Memorial Prize by the Economic Society of Australia. Dr Cain Polidano and Dr Chris Ryan received the inaugural award for their paper on how reading proficiency impacts employability. The 2017 paper: “What Happens to Students with Low Reading Proficiency at 15? 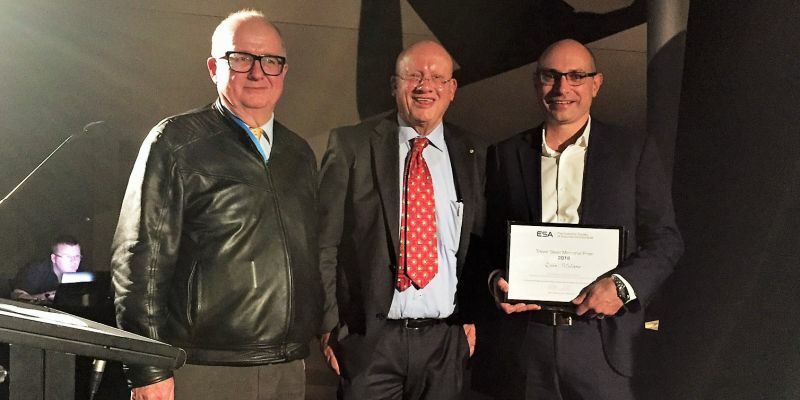 Evidence from Australia”, was announced as the joint winner of the Trevor Swan Memorial prize at the Australian Conference of Economists in Canberra last night. The Economic Society established the prize last year to recognize the best contribution to public policy published in the Economic Record in the preceding two years. Dr Cain Polidano (right) with ESA President, Dr Matthew Butlin, and Trevor Swan's son, Peter Swan. "Chris and I are absolutely thrilled to receive the inaugural Trevor Swan memorial prize, a man who is not only arguably Australia’s greatest economist, but whose research was focussed on informing Australian economic policy," said Doctor Polidano. "Having an esteemed committee recognise that our paper has made an important contribution to Australian policy is a real honour." Melbourne Institute Honory Professorial Fellow, Allan Fells, was also honoured on the night, receiving the Distiguished Public Policy Fellow Award for his contributions to public debate on policy issues. The Institute’s former director, Professor Deborah Cobb-Clark, was recognised for her role in the development of economics as a profession, receiving the Distinguished Fellow Award.